Yes here's an ode to the French's pronunciation: Chocolat. 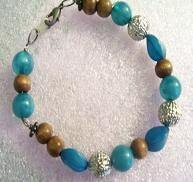 I took 2 years worth many moons ago and never perfected the language as beautiful as it is, but when I had an assortment of blue and brown beads the name just came to me! Woven with blue acrylic round beads, silver metal beads and wooden beads and is off set with vintage gun metal lobster claw clasp. These color combinations compliment each other as contemporary and classic. Sincerely OOAK and a great accessory to add or give as a gift! Measures 8 inches in length. Have a wonderful weekend mon amis!